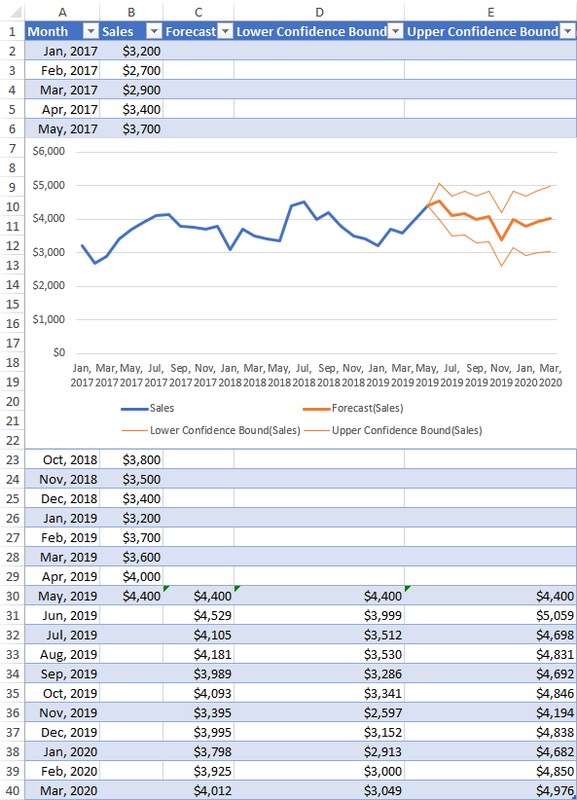 The tutorial shows how to do time series forecasting in Excel with the built-in Forecast Sheet feature and your own formulas. Forecasting is a special technique of making predictions for the future by using historical data as inputs and analyzing trends. This method is commonly used to make educated guesses on cash flows, plan budgets, anticipate future expenses or sales, and so on. However, forecasting doesn't tell the future definitively, it only shows probabilities. So, you should always double check the results before making a decision. Exponential smoothing forecast - time series forecasting based on historical data with seasonal or other cycles. Linear forecast - predicting future values using linear regression. Exponential smoothing forecasting in Excel is based on the AAA version (additive error, additive trend and additive seasonality) of the Exponential Triple Smoothing (ETS) algorithm, which smoothes out minor deviations in past data trends by detecting seasonality patterns and confidence intervals. This forecasting method is best suited for non-linear data models with seasonal or other recurring patterns. It is available in Excel 2016, Excel 2019 and Excel for Office 365. You can do such a forecast with your own formulas or have Excel create a forecast sheet for you automatically. 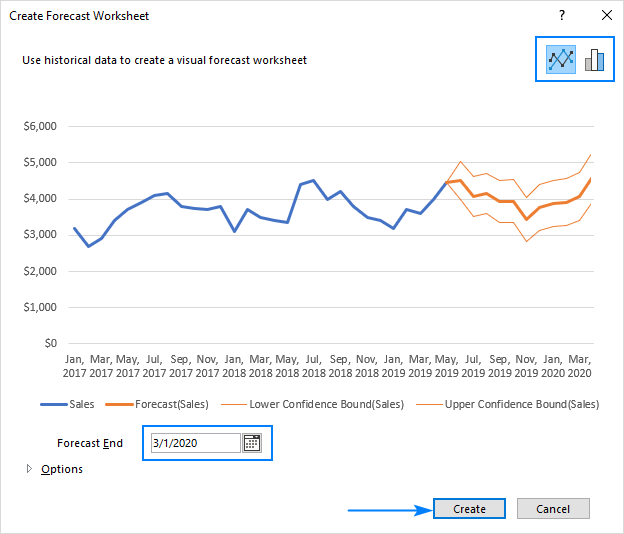 The Forecast Sheet feature introduced in Excel 2016 makes time series forecasting super-easy. Basically, you only need to appropriately organize the source data, and Excel will do the rest. Time series - date or time entries that are observed sequentially at a regular interval like hourly, daily, monthly, yearly, etc. Data values series - corresponding numeric values that will be predicted for future dates. It is important that your time series have equal intervals between the data points. For example, you can supply weekly intervals with values on every Monday, monthly intervals with values on the 1st day of every month, etc. In theory, your time series can miss up to 30% of data points or have several entries with the same date or time, and Excel will still do the forecast correctly. However, it is recommended to summarize your data to get more accurate predictions. In this example, we will try to forecast sales for the next few years based on the following historical data. Please pay attention that column A contains dates (the 1st of every month) in a custom format that displays only the month and year. However, these are fully-functional dates, not text values. Select both data series. In most cases, it is sufficient to select just one cell in any of your series, and Excel picks up the rest of the data automatically. Go to the Data tab > Forecast group and click the Forecast Sheet button. Excel immediately creates a new sheet containing a table with your original and predicted values as well as a chart that visually represents this data. 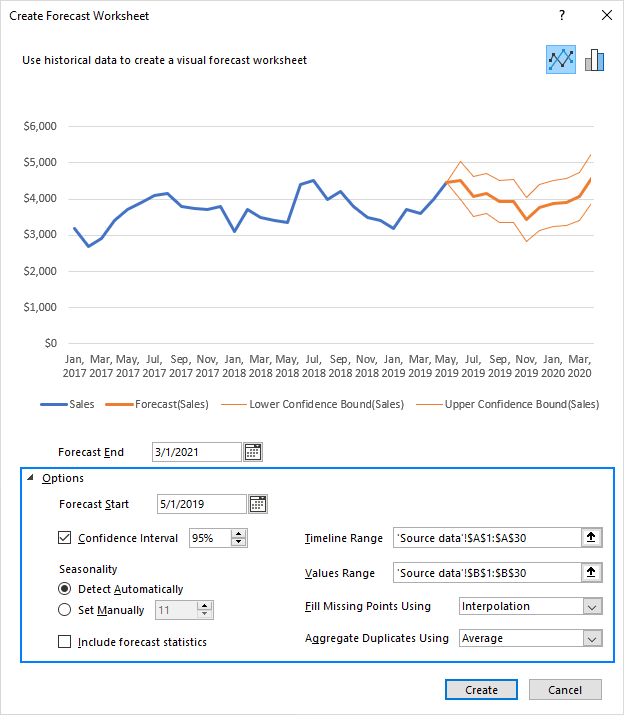 To find out how the predictions are calculated, click on one of the future values in your forecast worksheet and investigate the formula. Or check out Exponential smoothing forecast formulas for a quick overview. Forecast Start - the start date for forecasting. You can either select a date from the date picker or type it directly in the box. If your data is seasonal, it is recommended to start a forecast before the last historical point. To see how well the predictions match the known values, pick a date before the end of the historical data. In this case, only data prior to the start date will be used for forecasting (this back-testing method is also known as hindcasting). Confidence Interval - a range in which the predictions are expected to fall. On the line chart, it is represented by the two finer lines on each side of the forecast line; on the column chart - by the error bar values. Confidence interval can help you understand the forecast accuracy. A smaller interval indicates more confidence for a specific point. The default level is 95%, meaning that 95% of future points are expected to fall within the range. You can check and uncheck the Confidence Interval box to show or hide it. And you can change the default value by using the up or down arrows. Seasonality - the length of the seasonal pattern in which regular and predictable data fluctuations occur. For example, in a yearly pattern where each data point represents a month, the seasonality is 12. Excel identifies the seasonal cycle automatically but also allows you to set it manually. When Excel is unable to detect seasonality (usually, with less than 2 cycles of historical data), the predictions revert to a linear trend. Include Forecast Statistics - additional statistical information on the forecast. Check this box if you want Excel to generate a table of additional statistics such as smoothing constants (Alpha, Beta, Gamma) and error metrics (MASE, SMAPE, MAE, RMSE). All these values are calculated by using the FORECASE.ETS.STAT function. Timeline Range - the range used for your timeline series. By default, it includes all dates in your source table, but you can change it here. Values Range - the range used for your value series. It should match the Timeline Range. Fill Missing Points Using - controls how missing points are handled. By default, Excel uses the Interpolation approach where the missing points are filled based on the weighted average of neighboring points. Alternatively, you can select Zeros to treat the missing points as zero values. Duplicate Aggregates Using - determines how multiple values with the same timestamp are calculated. The default option is the average, but you can pick any other calculation method from the list, e.g. Median, Max or Min. A forecast sheet created by Excel contains two columns with your original data (timeline series and the corresponding data series) and three calculated columns (forecast values and two confidence bounds). Naturally, nothing prevents you from building a similar forecasting model yourself by using the following formulas. For the detailed explanation of each argument, please check out Using FORECAST.ETS function in Excel. 1 in the 4th argument (seasonality) - tells Excel to detect seasonality automatically. 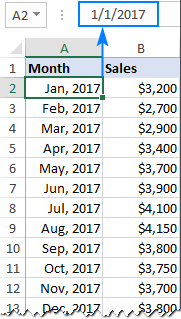 1 in the 5th argument (data completion) - tells Excel to complete missing points as the average of the neighboring points. The 6th argument (aggregation) is omitted, which means that multiple values with the same time stamp are to be aggregated using AVERAGE. To return a confidence interval for the forecast value at a specified date, the FORECAST.ETS.CONFINT function is used. 0.95 - the confidence level is equal to 95%. 1 in the 5th argument (seasonality) - automatic detection of seasonality. 1 in the 6th argument (data completion) - missing points are completed based on the average of the neighboring points. 7th argument omitted (aggregation) - aggregate multiple data values with the same time stamp by using the AVERAGE function. In the automatically created Forecast Sheet, Excel does not output the confidence interval value. Instead, it uses the FORECAST.ETS.CONFINT function in combination with the forecast value to calculate the Confidence Bounds, provided the Confidence Interval box is checked in the Options section. Where C31 is the forecasted value returned by FORECAST.ETS. For data without seasonality or other cycles, you can predict future values by using linear regression. This method is also suited for small and simple data sets that do not have enough historical data to detect seasonality. 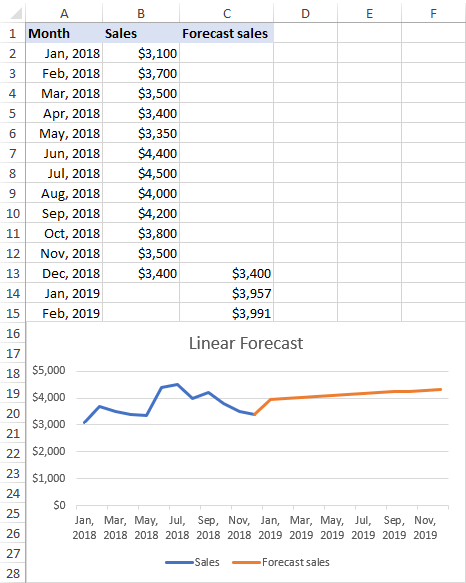 Microsoft Excel does not provide a built-in feature to do linear forecasting automatically, but it does have a special function for this, more precisely, two functions: FORECAST and FORECAST.LINEAR. 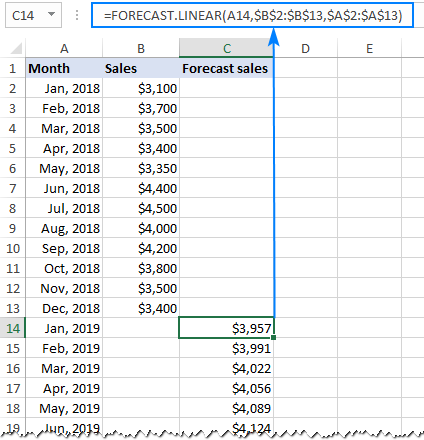 In Excel 2016 and Excel 2019, both functions are available, but it is recommended to use newer FORECAST.LINEAR. In Excel 2013, 2010 and 2007, only the FORECAST function is available. The detailed explanation of the functions' syntax can be found in this tutorial: How to use FORECAST function in Excel. For now, let's focus on a liner forecast example. Please pay attention that we lock both ranges with absolute cell references to prevent them from changing when we copy the formula down the column. To better understand the future strategies, you can visually represent the predicted values in a line chart. Copy the last historical data value to the Forecast In this example, we copy the value from B13 to C13. This will help us achieve the effect of a continuous uninterrupted line. Select 3 columns of data: time series, historical data values and forecasted values. On the Insert tab, in the Charts group, click the Insert Line or Area Chart icon and choose the first chart type (2-D Line). That's how to do forecasting in Excel. To have a closer look at the examples discussed in this tutorial, you are welcome to download our Excel Forecast Sample Workbook.